Talc and Talc 80/20 Graphite Blend: Why use TALC USA’s talc and talc/graphite blend products? They are a high-grade premium 200 micron grind Talc for improved planter performance but also fortified with iron and manganese for increased yield & plant health. Inceptive: Inceptive, equipped with a Harpin Protein, is designed to enhance your plant’s defense mechanism. It’s easy to use by mixing with either Talc or 80/20 Talc Graphite to suppress cyst and pest nematodes. Inceptive promotes improved root systems and germination while also increasing photosynthesis and early vigor. MicroSurge Corn and Soybean Inoculants: Microsurge inoculants can be easily applied by mixing with Talc and 80/20 Talc Graphite as a planter box treatment and are designed to increase mycorrhizal activity for improved soil health. Orders placed by March 1 receive free shipping! 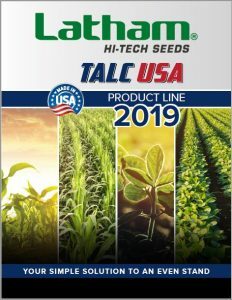 Contact your Latham Representative for information on which products might get your crop off to a great start this growing season.